We are the premiere ipe decking supplier in North Carolina. Conveniently located in Grover NC, we are able to offer low ipe prices plus reduced shipping rates. Whether you need a truckload of odds and ends delivered to your home in Durham, or a bundle of 1x6 ipe deck boards for your green home project in Winston-Salem, we handle custom orders each and every day. Our line of exotic hardwoods is led by ipe, the strongest wood in the world. Our other species are right on its heels. Cumaru, Tigerwood, and Garapa Decking are all perfect for the North Carolina climate. They're all guaranteed to outlast and outperform composite and pressure-treated materials by a longshot. We strongly support our environment, and that's not just sales talk. By being active members of the United States Green Building Council and the Forest Stewardship Council, we are able to practice what we preach when it comes to promoting eco-friendly wood. 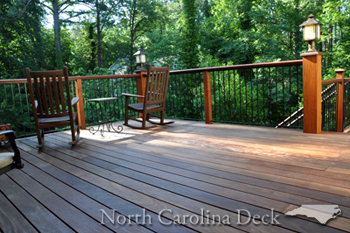 We have a couple of convenient options for North Carolina residents to buy ipe decking. You can call our local lumber supplier number directly, or you can use our convenient online quote form. Once you complete the form, you will be contacted directly by one of our local and extremely knowledgeable associates. We look forward to hearing from you soon!